The surviving work of Flemish painter Jan van Eyck consists of a small number of painstakingly detailed oil paintings of astonishing verisimilitude. Today considered the most significant Northern Renaissance artist of the 15th century, van Eyck gained prestige that rests largely upon his unrivaled skill in pictorial illusionism. His virtuoso technique exploited the use of oils, light, sumptuous draperies, and an almost photographic realism, which placed the visible world at the heart of his creations. This approach changed perceptions about painting forever. Like never before, the material and physical world found its almost perfect painterly equivalent. It is known from the historical record that van Eyck was considered to be a revolutionary master throughout northern Europe, even within his own lifetime. His influence was profound, and his style and technique were widely copied by other painters. Only some 25 paintings survive today that can be confidently attributed to van Eyck; one of these is Madonna at the Fountain. Most are rarely permitted to travel, making this centennial loan from the Royal Museum of Fine Arts in Antwerp something extraordinary. Jan van Eyck, born around 1395, is the most famous member of a family of painters that originated in the town of Maaseik in the diocese of Liège in what is today Belgium. He trained with his brother Hubert. Some scholars have proposed that Jan initially began work as a manuscript illuminator, and this seems to be supported by the fine technique and small scale of his works, as well as payment records for initials that he painted in a book for the Burgundian duke, Philip the Good, in 1439. 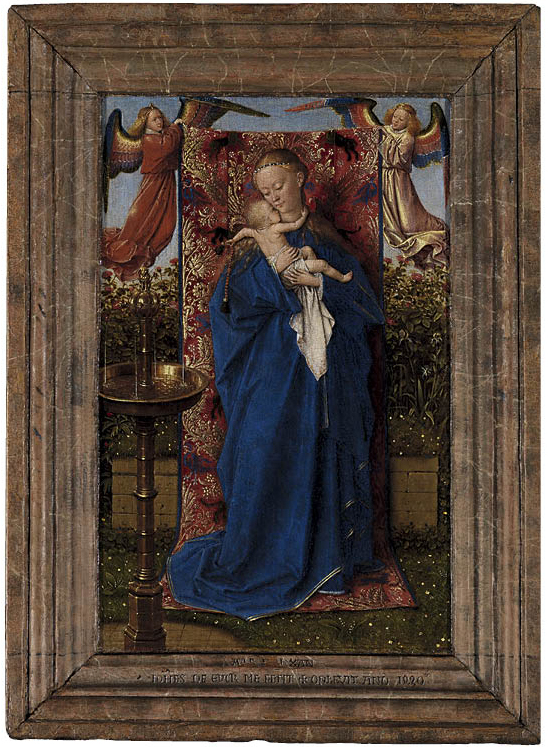 The small panel of the Madonna at the Fountain dates to 1439, when van Eyck was already in the service of Philip the Good. Though only 7½ inches in height, the jewel-like picture is exquisitely painted. It depicts the Virgin standing and holding her infant son in a verdant garden filled with flowers and a brass garden fountain that appears painted from life. Van Eyck has painted the Virgin wearing a sumptuous flowing blue robe with deep folds, the color of heaven. A physical intimacy is evident between the mother and her cradled child, their cheeks touching. Behind the mother, two angels suspend an ornate cloth of honor. The fountain and the garden, both deeply symbolic, reference Solomon’s Canticle of Canticles (4:12) as an allegory for the love and union between Christ and the Church, a mystical marriage with the Church as the Bride of Christ. The scene also references the mystery of Christ’s conception and the doctrine of the perpetual virginity of Mary represented allegorically as a closed-off garden, the hortus conclusus. This was a well-known emblem of the Virgin used in medieval and Renaissance art.